Cheese meets chocolate. A friendship is formed. Sometimes, an odd scrap of leftovers leads me in an unusual direction. Today was one of those days. It all began with 6 sheets of leftover spring roll wrapper. I’ll tell you in advance, the gamble paid off. Dessert was delicious. 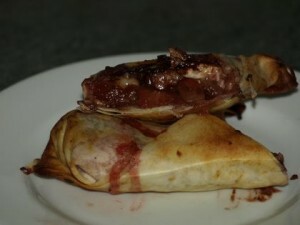 Strawberry, chocolate and camembert dessert rolls. Place 2 wrappers together, spoon 1/4 mixture on top and fold into spring roll shape. Repeat until you have 4 rolls. Bake for 5 minutes or until golden, turn and cook for another 5 minutes until both sides are golden. That’s a fairly inventive use of spring roll wrappers! Did any of the chocolate melt out of the roll? I wonder if it would work just as well fried. None of the chocolate melted out. Probably because of the double wrapping (and my superlative wrapping skills LOL). I’m sure it would work fried, you’d have to be a little more careful of leakage. What I preferred about baking was being able to use butter. I thought the oil taste might take over. Besides, I’m meant to be shedding winter padding, not adding to it! I love this kind of reinvention! Camembert and chocolate is an intriguing combination. The Bread Winner didn’t know it was camembert until I told him. Then he claimed he could taste it. I must say, I am stunned. I never would have thought of it. Ricotta yes, but camembert and choc are unlikely bedfellows? 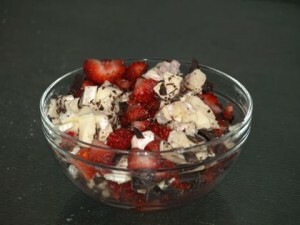 Perhaps it’s a marriage similar to the blissful alchemy of strawberries with Balsamic vinegar? Perhaps so Docwitch. I don’t think it would work with milk chocolate. I think it was the dark chocolate factor that made it work. That sounds MARVELOUS. 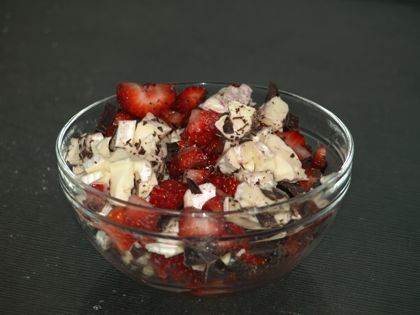 Cheese and chocolate are my two best friends, with strawberry being an excellent alternate friend. Looks so good! I’ll definitely try it. That is sweet. Anything that promotes fair trade chocolate is a good thing. Child slave labour chocolate makes me weep. It’s the ultimate act of selfishness. Good read, thanks for adding our comment to the post. Hey, a great number of for taking the effort to do this. I love your web pages, though it took a slow reader like me some time to via in excess of the complete page and all the comments.